A seven-acre dirt field and hanger made up the Aeronautic Concourse. The area was was surrounded by a 6,559 dollar 30-foot high fence (in order to redirect wind). The crudely made buildings included a large aerodrome that cost 13,888 dollars; also called the balloon house, it was used to inflating balloons from the two concourse's gas plants which cost 16,052 dollars. Gliders, kites, captive balloons, and motorized balloons were also flown. While the Wright brothers flew their historic 12 second self-propelled flight in December of 1903, the Fair became a platform for flight development. The US government posted a 100,000 dollar prize during the Fair, who could build a one-seater self-propelled flying machine. Further rules demanded that the fliers needed to maintain a flight speed of at least 20 miles an hour and return from a triangular one mile designed course. If accomplished before July 1, 1904, there would be an added 10,000 dollar bonus. Crude airplanes and dirigibles were used during the June first through September 30th contest, but not one person won the award. Still progress in development was made. Most airships and dirigibles had problems controlling direction. Aeronauts such as E. C. Benbow from Butte, Montana and Hyppolyte Francois of France, were unsuccessful on the prescribed course. San Franciscan dirigible designer- Captain J. S. Ballwin's `Californian Arrow,' made a successful flight, under the piloting of N. Roy Knabenshue, but did not achieve it on the prescribed course as well as within the contest's time frame. 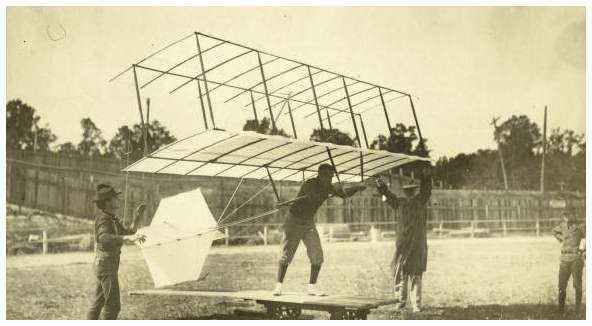 William Avery, one of aviation pioneer Octave Chanute's proteges, made glider demonstration flights. On October 19, the Fair help a kite flying contest open to adults as well as children. On October 25, the Californian Arrow made a 20 mile flight, that lasted 37 minutes at an altitude of 2,000 feet. The air ship left the fairgrounds and landed safely in East St. Louis. Knabenshuee later became America's first dirigible pilot, and went on to build the first passenger dirigible in the U.S. The California Arrow held 7,500 to 8,000 cubic feet of gas. The Wright brothers did not participate at the St. Louis Fair. After touring the site earlier that year, they concluded that the grand prize contest was unachievable. On May 16, 1904, Santos-Dumont wired Fair officials informing them that he: "Lost sixty horse power engine. Only able to get forty. Airship tried yesterday. Only goes less than twenty miles (per hour). Cannot race until speed condition is cut down to fifteen miles per hour." Fair Transportation chief- Willard Smith told Santos-Dumont that they would change the rules. In fact, there was a 50,000 dollar prize if a speed of fifteen miles an hour is attained; 75,000 dollars if eighteen mph was obtained; 100,000 dollars if he went twenty miles mph. The fifteen-mile prize will be 69,000 dollars, if the flight is effected in June. The management of the Fair offered a 10,000 dollar bonus if any contestant performed a successful flight at either of these three speeds before July 1. Unless a minimum of fifteen miles per hour were attained, however, no prize would be awarded at any time. Santos-Dumont's plane arrived by train from New York on June 26 in three large eighteen foot cases, each weighing two tons. Without the superintendent of aeronautics' approval, Santos-Dumont left the cover off the crate in the evening to let the air circulate around the envelope. At 7:00 a.m. the next day, June 28, one of the French mechanics discovered four, yard-long slashes in the gas bag obviously from a knife. Nightwatch man J.H. Peterson had been on duty from dusk until midnight, when he was relieved by Lucian T. Gilliam. Gilliam stated that he had been absent twice during the night for short periods for cups of coffee. The Exposition Company offered a 1,000 dollar reward for the culprit. Santos-Dumont left for Paris July 1 without cooperating with the police or pressing the investigation. He had told exposition officials that he would repair his ship and return by September, but on July 14, 1904, he knew it work take at least two months to repair the damage on Number 7, at a cost of 8,000 dollars. Some felt the arson was the work of a vandal or a jealous rival, while the Esposition's Jefferson Guards thought that Santos-Dumont himself had slashed the envelope because he feared that he would fail in the severe trials and wished to save face. Baldwin's airship- `California Arrow' leaving the Concourse. His ship had a front propeller, which Baldwin said steadied the craft. William Avery, the Fair's premiere Gilder operator, is pictured underneath a glider (that was taken in Chicago). Inflating a blimp at the Fair.